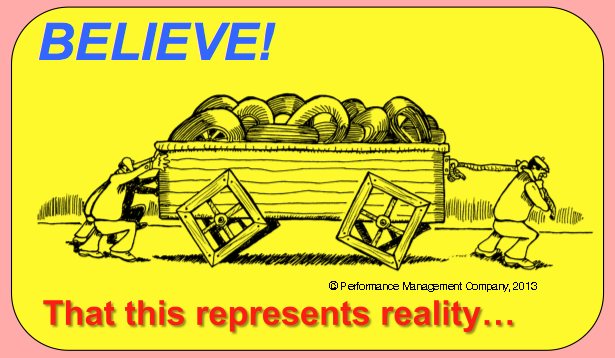 One of the things that becomes more and more apparent is that the metaphor of “Square Wheels” can be everyday language of performance improvement. Things that are “Square Wheels” are simply the things that do now work smoothly. A process can work, but things can always be improved. We get, for example, occasional comments from customers that they cannot immediately download one of the toolkits on our shopping cart or that there is a problem of some type. The issue revolves around one of two things, apparently. Sometimes we update the zip-compressed file and we somehow change the name from “Square Wheels Facilitation Toolkit.zip” to SquareWheels Facilitation Toolkit.zip.” We just miss it! That feedback happens once and we try to immediately change the file name to align with the structure of the cart. Much more common is the reality that the credit card might not be approved immediately — our transaction processor really wants to be sure that the card used is legitimate and since our little business is completely international these days, they might apparently do a bit more electronic validation, even though we have had only a small number of bogus transactions over the years. Can I hear a thump thump? What seems pretty scary going forward is that the laws on state taxation of internet transactions is going to muddy things up a bit. After all, we all know that the Square Wheels are really Everywhere! Right? ← Is Daylight Savings the Time for Change?